DESIGNER WEEKENDS: SHOE ORAGNIZERS REPURPOSED! Last week I posted a note about the outdoor furniture sale at Restoration Hardware. I visited RH later that day to take advantage of the great deals and source an outdoor sofa for one of my clients. Even more exciting than finding the perfect sofa at the perfect price was my adventure into Restoration Hardware’s secret sample room. Thanks, Pedro, for giving me the exclusive! The room featured rows and rows of shoe organizers holding upholstery fabric samples. The organizational queen in me fell in love. Can I have one for myself? It got me thinking about all of the other interesting ways one could repurpose a shoe organizer. Below are some of my favorite ideas. I’ll take one for every door, please! What do you do with all of the birthday, thank you, and holiday cards you receive over the years? They bring back such great memories, you can’t think of disposing of them. But they sure take up a lot of room! The above image, from Keri Cosner on Pinterest, offers a very clever solution. Packing up for a day in the park or the beach with kids can require a lot of pre-planning. Sunscreen? Check. Sippy cup? Check. Heather, at Décor-ganize Crafts, offers a brilliant solution for making car packing easy. Just trim a shoe organizer and keep it all in the car! There’s nothing like 90 degree days in the city to make you wish you had a yard. Especially one with a pool.! Until then, you can create an indoor garden by planting small plants and herbs in a shoe organizer. RawNut’s Blog shows us how. Everyone has that drawer in the kitchen that screams for you to cram it with junk. And when you need batteries, or a rubber band, or where on earth is the coupon you cut out, you can never find what you’re looking for. Better Homes and Gardens shows us how to clean out the drawer and make finding “junk” a snap! There’s a clean sponge under the sink somewhere, but it’s buried somewhere behind the cleaning products and rubber gloves. The cabinet under the sink can become a scary place. The Complete Guide to the Imperfect Homemaking offers a terrific solution to making the sink cabinet more navigational and less frightening! Someone hasn’t screwed on the top to the cough syrup, and now it’s dripped all over the bottom of your first aid kit. And just in time for when one of your kids falls and bumps his knee on the playground! 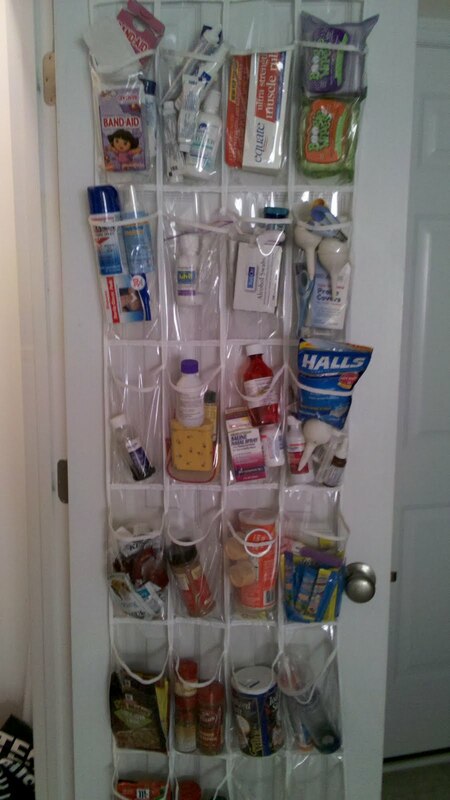 Problem solved with a shoe organizer repurposed as a first aid kit, courtesy of Mommy Likes Deals. Do you have any great organizational ideas you’d like to share? Let me know as we’re always looking for clever ways to simplify storage!